VIBRATION CONVERTER Vibro-Converter Model-2501 Compact piezoelectoric sensor suitable for measuring application such as high temperature and high vibration level is selectable, up 4 to 20mA output corresponding to vibration values is adjustable within a certain range. AC output is available for waveform analysis using a FFT analyzer. 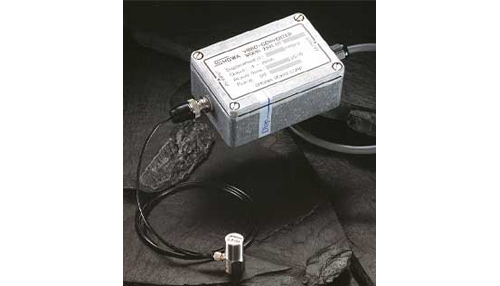 This unit is easily connectable to a recorder, indicator or data collector is a remote location. Pick up Model-2300A, 2300A, etc. Low-pass filter IN……1KHz cut-off (-3dB), Any frequencyis optionally available(within range of 50Hz to 5KHz). Measuring range Any value is adjustable to maximum output of 20mA within the range of 20m/s to 200m/s. 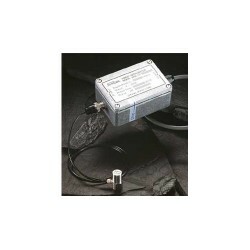 Measuring range Any value is adjustable to maximum output of 20mA within the range of 0.2mmp-p to 2mmp-p.